With our busy lifestyles, we enjoy snacks and meals on the go more than ever before. 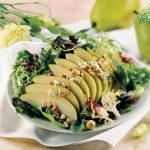 Keep your snacking healthy with pears! Each serving is only 100 calories and they a good source of fibre, and provide Vitamin C. They are easy to store, pack, and eat on the go—but enjoying pears whole isn’t the only way to snack happy! 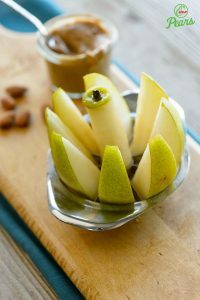 Slice pears and top with some almond butter! This is a delicious combination! Spread some goat cheese on top of sliced pears and sprinkle cranberries and pistachios for a snack that everyone will enjoy. Add sliced or cubed pears to oatmeal, yogurt, or granola. 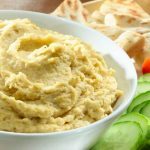 Incorporate pears into hummus for a sweet kick to your favourite dip! Pizza doesn’t just have to be a meal, serve it like a flatbread for an after school snack. It’s healthier with pears! Satiate your hunger with a pear smoothie. With lots of fibre and energy to last you until your next meal, smoothies are a smart way to start your day or to get over that 3 pm hump! Wrap some prosciutto around pears and a strong cheese like blue cheese, parmesan, or even aged white cheddar for a sophisticated snack or even appetizer! Content sponsored by USA Pears.